The Palace of Culture from Iași represents the expression of romanticism inspired from the official architecture, being built between 1906-1925, in neo-Gothic style, it was officially inaugurated in 1926, by the second King of Modern Romania, Ferdinand of Hohenzollern. This palace is perceived as being the most important creation of I. D. Berindei, a Romanian architect, educated at the Parisian school. Although it has an archaic appearance, the edifice was also provided with facilities considered to be of cutting-edge in the epoch when it was erected, these include electric lightening, pneumatic heating, thermostats, ventilation systems, vacuum cleaners switched on from the basement etc. For the building were used lightweight materials which were less costly, the architect Berindei, by taking into account the 14 fires that affected the buildings that existed there before the Palace, fireproofed the attic’s woodwork with a material entitled orniton, while for the roof he utilized a special material, named eternite. 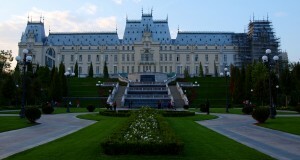 The Palace was used as barrack for the German and Soviet troops, during the Second World War, and until 1955, when it hosted the most important cultural institutions in the country, reunited under the name of Moldavia’s National Museum Complex from Iasi, served as the Administrative and Justice Palace. On the inside, in the West wing on the ground floor of the Palace of Culture, is placed the History Museum of Moldavia, the sequel project of the Antiquity Museum founded by Orest Tafrali, in 1916. Also at the ground floor, but in the East wing, is housed the Science and Technique Museum “Ștefan Procopiu”, whose foundations were laid since 1955. On the upper floor, one can admire the Romanian and European art galleries of the Art Museum, the sequel project of the oldest pinacoteque in the country, which dates back in the year 1986, and comprises the donations of Gheorghe Asachi, Scarlat Varnav, Costache Dasiade, A. Donici, V.A. Urechia and Costache Negri. Last, but not least, Moldavia’s Ethnographic Museum is located in the West wing of the Palace, on the first and second floor. This museum dates since 1943 and encapsulates elements of traditional civilization, owning ancient objects with a history of more than 100 years. Apart from the incontestable cultural and historical value, this edifice is also distinguished through its peculiar elements of architecture. The famous clock from the palace tower with three quadrants, has a diameter of 3.25 m, and is decorated with small stained glass, with representations of the 12 astrological signs. Also worth mentioning, are the 8 bells, from the palace tower, which are singing the “Hora Unirii” (the round traditional dance) at each and every exact hour. The song is recorded on a drum with 69 pins, reminding not only about the “Unirea cea mică” from 1859, but also about “Unirea cea mare” from 1918. The equestrian statue of Stephen the Great, designed in Paris, according to the sketches of Gh. Asachi, by Em.Fremiet, represents one of the fundamental decorative elements which embodies the architectural beauty of the monument. The statue lies in front of the Palace, and it was firstly unveiled in 1883. With the occasion of this event, Mihai Eminescu composed the famous poem “Doina”. This date also marks the event when king Carol I offered two Krupp cannons, trophies from the War of Independence, achieved by the Dorobanți regiment from Copou (one of the seven hills of Iasi). In August 2008 the works for the restoration and consolidation of the Palace begun. The degradations broadened after the earthquake from 1986, which caused cracks, crevices and deterioration on important surfaces of the walls, ceilings and at the level of the decorative elements. In the middle of April of this year (2016), the Palace of Culture will open its doors for the visiting public, offering temporary outstanding exhibitions, with pieces from the patrimony of the four museums within Moldavia’s Museum Complex. Although the monument has 298 rooms, with a total area of 36.000 m2, the art and history lovers will not have the opportunity to visit them all, only the rooms placed on the right and left side of the entrance from the ground floor along with the first floor which will have the Voivodes’ Hall on display, and few other rooms.